Pholiota adipose is a slimy mushroom with bumpy ridges on its top. Along with be farmed naturally, it is produced by human-made methods. It is said to have a crunchy consistency. Uses include use in hot pots as well as miso soup. 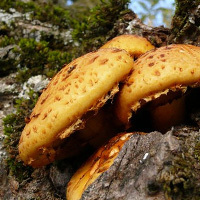 The calories in Pholiota Adiposa per 20g(1item) is 3 calories. Pholiota Adiposa is calculated to be 15Cal per 100 grams making 80Cal equivalent to 533.33g with 0.82g of mostly carbohydrates、0.46g of protein、0.08g of fat in 20g while being rich in vitamins and minerals such as Niacin and Pantothenic Acid.